Are you sitty comfy bold two square on your botty? Long before Rod Stewart and Ronnie Wood got together to form the Faces in the early 70’s there was a pop group in England called The Small Faces who formed in the early 60’s and had hits glore in the UK. Original members included singer Stevie Marriott who had a spit~in~your~eye attitude leading on three other renegades ~ Ronnie “Plonk” Lane on bass, Kenney Jones on drums, and Ian McLagen on keyboards. The latter three were to join Rod the Mod and Ronnie Wood in the Faces after the Small Faces broke up and Stevie Marriott went on to form Humble Pie. The Faces first album First Step was released in the USA as the Small Faces. They were called The Small Faces because they were all no taller than 5′ 6″ and they performed some of the most raucous R&B and soulful music this side of the Wapping Wharf with influences such as Booker T & the MGs, Sam Cooke and Solomon Burke. They also looked good with a great image, and were the Mod kings of swinging London, the boys had clothing accounts at all the best shops in Carnaby Street while the rest of us Mods & Rockers fought it out in Brighton. The Small Faces early hits are classic slices of Mod Pop, ‘Whatcha Gonna Do About It’, ‘ Sha La La La Lee’, and ‘All or Nothing’ all released on Decca Records. By 1967 the groups songwriting had began to mature and a change of record label from Decca to ex Stones manager Andrew Loog Oldham’s new Immediate Records allowed them to not play live so much and have more studio time and artistic freedom just like the Beatles with Sgt. Pepper as the flower power era dawned. Starting with ‘ Here Comes The Nice ‘ The Small Faces blazed a spectacular coloured soundscape across the sky. The truly remarkable Itcycoo Park (their only US hit) was followed next into the charts by Tin Soldier. This is my all time favourite song, full of passion it still today explodes out of the speakers with former Ikette P.P Arnold on backing vocals spurring on Stevie Marriott to one of the greatest UK soul performances ~ ever! Everyone nowadays talks about Pete Townsend and Ray Davies being the great spokespersons and class observers of the British 60’s generation but I think we should take our hats off to Stevie and Ronnie as great songwriters as well! I remember buying ‘Lazy Sunday’ with Stevie’s cockney voice and the great sound effects on the record while staying at my Aunt Alice’s in Bournemouth on the south coast of England and I must have driven her crazy playing that song and the B side ‘ Rollin’ Over ‘ maybe over a thousand times that Easter weekend. Their last single to just make it into the Top 30 was ‘ The Universal ‘ and what a truly unique record it is! Partly recorded in Stevie’s back garden with dogs barking in time it features a crazy clarinet part and a Chet Atkins style guitar solo and it’s totally uncommercial but they still made it on to Top of the Pops for a memorable performance. Like most of the British bands from the 60’s the Small Faces 45 rpm records have great B ~ sides like ‘ Talk to You’ with a powerful passionate Marriott vocal and ‘ I’m Only Dreaming ‘ a beautiful love song with a light arrangement and once again sang with great soul by Mr. Marriott. B~side ‘ I Feel Much Better ‘ starts with Ronnie Lane’s bass ~ the baddest sound this side of the Watford Gap with P.P. Arnold once again supplying the backing vocals and a great fade at the end of the record. ‘ Rollin’ Over ‘ comes on like a steamroller coming at ya with a killer brass section and Kenney Jones really showing what a great drummer he is and Ian McLagen as melodically inventive on the keyboards as ever and on top of all that another epic vocal from Stevie Marriott. ‘ Donkey Rides A Penny A Glass ‘ always reminds me of my school holidays at my Dad’s caravan on the Essex coast on those hot summer days! grooving along quite naturally. Brilliant! Then to top it all off and to light the candles on their cake the boys produced the classic ‘Ogden’s Nut Gone Flake ‘ album released on May 31st 1968. I remember that day was full of sunshine as I travelled to Barking in Essex by bus to buy this extraordinary record with its round artwork sleeve ( a first ) and the fairy~tale story of Happiness Stan on Side Two of the record narrated by Stanley Unwin in his own strange but unique Unwinese language taking us all off to another world!. This album sounds fantastic in mono. A brilliant album full of great songs and east end music hall humour that was overlooked in North America but which is full of the a deep joy and thorkus, a great laugh ‘n’ tittery for the heart as Stanley would say. There’s Only One Presley ~ Reg ! If you travel south~west out of London from a distance of about 66 miles along the B3400 you will come to a town called Andover ~ the home of legendary pop group The TROGGS. In 1966 the population of Andover boasted around 19,000 people and amongst them was one Reg Ball ~ lead singer of this raw new caveman rock group called The Troggs and band members Chris Britton on guitar, Pete Staples on bass and last but not least Ronnie Bond on drums. Their debut 45 single was just about to be released on Fontana Records and was called ‘ Lost Girl ‘ . This great slab of garage rock would miss the charts by a mile! and that could have been the end of their career in pop music had it not been for Larry Page who looked like Michael Caine’s brother and had been involved in managing the Kinks before starting his own record label called Page One Records. Reg Ball at this time was a bricklayer and was told by Page to change his surname to Presley because it was more showbiz and he also presented them with a demo song to learn by American songwriter Chip Taylor ( brother of actor John Voight ) and it was called ‘ Wild Thing ‘. Chip Taylor also wrote ‘ Angel of the Morning ‘ . The song had been released in 1965 in America by Jordan Christopher & the Wild Ones which is very different to the Troggs version but good, more kind of hippy folky. 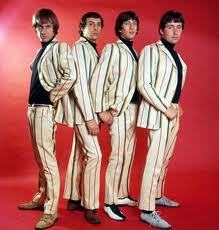 The Troggs primitive style turned ‘ Wild Thing ‘ into a world beater hitting the charts in both the UK and the USA. The Troggs version is not that different to Chip Taylor’s version but the songwriter rates the Troggs version as the best! Hedgehoppers Anonymous also recorded the song, but they tried to make it sound too musical by trying to sing it and it was diabolical. Later in the 60’s Jimi Hendrix turned it into his own song when he played his dramatic psychedelic version at the Monterey Pop Festival in 1967. 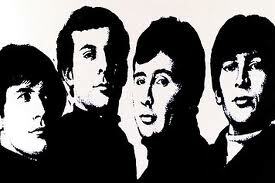 Next release for the Troggs was the No. 1 hit ‘ With A Girl Like You’ which was recorded at the same session as ‘ Wild Thing ‘ in fact both songs were recorded in 45 minutes at the end of a Larry Page Orchestra session with both songs becoming hits. Reg says he got fed up with appearing on Top of the Pops the chart TV show. September 1966 saw ‘ I Can Control Myself ‘ with it’s risky lyrics given restricted air play on the BBC and being completely banned in Australia, but still it was a hit ! Followed by the beautiful ‘ Anyway That You Want Me ‘ another Chip Taylor song hit the chart in December making 1966 a mighty memorable year for the boys! 1967 saw the suggestive ‘ Give It To Me ‘ and ‘ Night of the Long Grass ‘ both charting high in the first half of the year and 1968 produced the classic flower powered ‘ Love Is All Around ‘ become a monster hit which was written by Reg Presley who was turning into a hit songwriter himself. In 1994 Wet Wet Wet record a hit version of the song which was also featured in the mega movie ‘ Four Weddings and a Funeral ‘ all of which did very nicely for Mr. Presley’s bank balance, interestly Reg said he spent most of the money on researching crop circles ? Maybe the Troggs are best remembered in some circles for the Spinal Tap inspired ‘ The Troggs Tapes ‘ a 12 minute studio argument in which drummer Ronnie Bond can’t quite get the beat right on a new song and has the rest of the band criticizing him and he can be heard saying ‘ I know it’s not right ~ and I’m the one playing it! Check it out on YouTube ~swear words and all ! Hearing all these songs again makes me kinda glad that Reg the Pres didn’t throw in the trowel all those years ago because who would have the Ramones got their inspiration from and many other bands. Reg Presley passed away on Feb. 5th 2013. 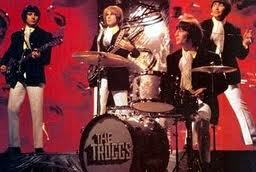 Andover and the Troggs rule ~ you better believe it ! Don’t tell Beatmerchant the CD is dead. Besides CDs, the tiny shop in Steveston has racks of vinyl, DVDs, books, posters and – for some reason – a selection of tea and coffee mugs. There are other stores in the Lower Mainland such as Zulu, Red Cat, Scratch and Neptoon. Each seems to specialize, so it’s no surprise that there is a British Invasion aura about Beatmerchant, that carries over to its selection of CDs. There are a lot of English imports in stock. This implies a knowledge of music – British at least – and a sympathy for the record buyer/collector. Want that rare Pretty Things single? Beatmerchant has (or had) it. This is especially warming for the long-time record consumer who’d heard nasty rumblings that the CD is dead. Stuck with their CD habit, averse to downloading, the inveterate collector has been forced to order CDs online and will for as long as CDs are made. Right now, Vancouver hasn’t a single chain where new CDs can be bought. This creates a self-fulfilling prophecy. If CDs sales are plummeting, it’s because nobody can buy a CD. They have no choice but to shop online . . . providing they know for which they’re shopping. Which is another attraction of Beatmerchant et al. : Browsing. One of the pleasures of record shop-ping used to be discovering, while browsing, records in the racks you didn’t know about or never thought you’d find. As well, some of my greatest guilty pleasures are records I bought because they were in the delete bin and cheap. Beat-merchant has a relatively small selection of CDs and vinyl at reduced prices. The store is located in the corner of a mall at 12240 2nd Ave.
Read more of my posts about local music at blogs.theprovince.com. Tues, Aug. 28th 2012: Esquimalt, Victoria, BC. ~ Fri. Sept 7th : Red Robinson Theatre, Coquitlam, BC. And now came the main event. Joe Walsh. Not really a“superstar” even though he is one of the Eagles, he’s always been a sort of a anti superstar. The stage was set, two full drum kits, a percussionist and three backing singers added to a rhythm guitarist,the bass player and get this, a keyboard guy playing a full size Hammond organ through a Lesley speaker no less! No digital effects or drum loops here just a rock n roll band. This is live music ~ no downloads. During the week the local radio station had been playing Joe’s latest work as a build up to the concert. One of which, in true Joe Walsh fashion, was about his own struggle with drugs and alcohol. He gave up his best friend vodka 18 years ago and looks trim and in good shape. Walsh’s music is, and has always been about how he sees the world and himself fitting into it with a sense of humour. Everybody’s so different ~ I haven’t changed. From the opening chords the night changed. No one was noticing the chill any more! No one was stting in their seats any more. Joe Walsh takes what he does very seriously, no going through the motions here, his delivery is nothing short of greatness. Every fiber of his body is focused upon the delivery of his music and the resulting passion and joy is plain to see everywhere. What adds to this is that while he takes his work serious he doesn’t take himself too much that way. “Nice town” says Joe “I spent a great week here one night in the eighties.” He plays a series of guitars provided to him by his guitar tech and plays within the band and not in front of them. This is a great band. 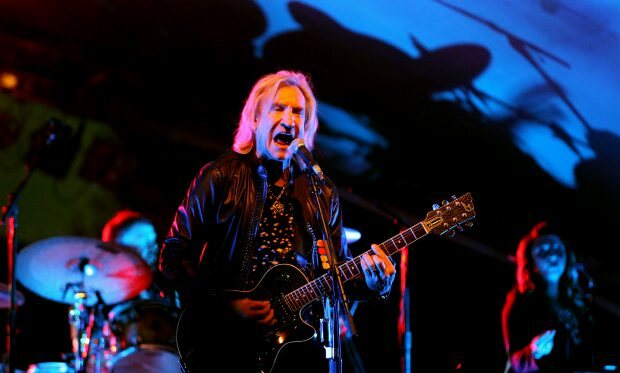 Think of any Joe Walsh song on an album you have, now go and listen to it, that’s the sound of recorded music, but there is so much more live! When you hear parts of Voodoo Child, Cast Your Fate To the Wind and Bolero weaving through his guitar work you are reminded of the late great Jimi Hendrix. This is a master class in guitar playing. When you look on in astonishment at the man who’s sounds have no right to be on this worldly planet swirling around and over you, making the hair on the back of your neck stand up on end and your heart skip a beat, and suddenly, just for a moment the world is full of magic and wonders and you are, not looking at the fourteen year old in the photo anymore you feel like that fourteen year old again. Joe played his James Gang stuff and his new work off Analog Man before he played I Shall Be Released which morphed into the best, a game changing version of his classic Turn to Stone. Both dedicated to his late friend Levon Helm. So was Rocky Mountain Way good? Did Life In The Fast Lane live up to expectations? Was Funk#49 still happening now? And maybe, just maybe there was a sharper edge to “Life’s Been Good To Me ”? It was all good for me. Everybody sing ~ He’s Cool! 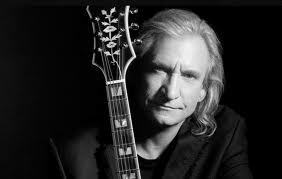 Sorry kids “if your mom and dad have played it to death in the past” but Joe Walsh is the great player you get! Make no mistake about what he brings to each and every song it is himself. 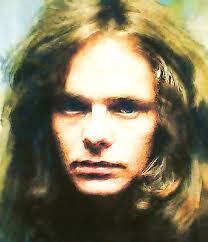 He is a premier guitarist, songwriter, singer and performer of epic proportions. If you can then see Joe Walsh and his band on the Analog Man tour before it’s gone. It is good to know that giants still walk among us. I am already using this experience as proof that being “authentic” is the difference between being there and just being. From a field, behind the Rec’ Center, Esquimalt. The Harpoonist and the Axe Murderer—or HAM as they’re otherwise known—combine blues and rock ‘n’ roll, and have a live show that’s anything but usual. They swing into Steveston Aug. 17. The Vancouver musicians limit their sound to whatever they can play between them—using only their mouths, hands and feet. Hall provides the vocals and blues harp, and Rogers handles the drums and guitar. The co-ordination between instruments—and themselves—is a show in itself, and the duo is proud to boast that it takes just minutes to get soaked with sweat. Music came to Hall when he was 12, living in Toronto. His grandmother gave him a harmonica and a book: Harmonica for the Musically Hopeless. At the same age, on the other side of the country, Rogers was falling in love with the guitar. The band, one of 20 finalists in the Peak Performance Project professional development program hosted by a Vancouver radio station, is now touring in support of their 2011 album Checkered Past. It’s the duo’s third album, addressing classic blues themes of heartbreak, addiction and layoffs. The band’s Steveston show is part of the Music at the Cannery summer concert series. The concert, organized by The Beatmerchant record store, begins at 6:30 p.m. at the Gulf of Georgia Cannery. Admission is by donation ($5 suggested); arrive early to get a seat. Coming up in the series: Tommy Alto on Aug. 24, and Swell & Swag and the Swagmen on Aug. 31. Back in 1969 I was lucky to be working at the Marquee studio which was round the back of the Marquee club in Wardour Street, London. I would sneak in the back door of the club at the end of the work day after a drink at the Ship pub to sit and catch the best of the bands appearing at the club. In those days the club used to have about six to eight rows of chairs in front of the stage and one evening I got in real early and sat in front of a Vox AC 30 amp perched on top of a chair. Plugged into that amp was a Fender Stratocaster with most of the wood vanish rubbed off the body of the guitar with a treble booster with was used during the solos. By the end of the evening my ears didn’t stop ringing for a week, but what a special evening. 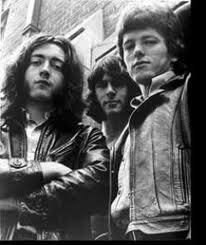 Rory Gallagher was appearing with his first group from Ireland Taste a blues/rock trio with John Wilson on Drums and Charlie McCracken on Bass. You have to go a long way to find a rhythm section as good as these two with Rory Gallagher on guitar and vocals and sometimes saxophone and harmonica this trio took some beating. Like a lot of the European guitarists he was drawing heavily from the American blues players of the 40’s and 50’s, but I must say the boy from Ballyshannon, County Donegal in Ireland could certainly play it well! Their first release in 1969 was the self titled album ‘Taste’ on the Polydor label. The album features tracks which would become live crowd pleasers like the blues classic ‘Sugar Mama’ a seven minute epic and ‘Catfish’ an eight minute epic along with originals ‘Blister on the Moon’ and ‘Same Old Story’. This album has a very raw sound with few overdubs. It is slightly jazzy in places but doesn’t stray to far from the blues with Rory playing some great slide guitar and finishing off with a version of the Hank Snow country song ‘ I’m Moving On’. After listening to the album you knew you had been listening to something special and live this was even more of a powerful experience seeing the band in action. Night after night Rory and the boys would deliver on the live circuit with Gallagher acting very humble and thankful for the enthusiastic response from the audience. No superstar trip here this was a great live band delivering the goods. 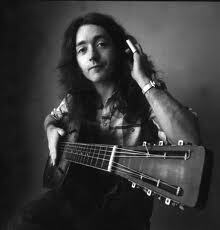 Rory would dress in his denim jeans and lumberjack shirt with his long hair hanging down in front of his face as he played and John & Charlie would not miss a beat whether they were appearing in a small club or at an open air festival across the countries of Europe. 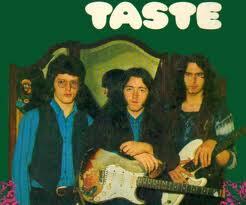 In 1970 Taste released their second album on Polydor called ‘On The Boards’ which made the British charts. The album starts off where the previous one finishes off and the lead track ‘ What’s Going On’ shows a progressive maturity with all three players on top form. The title track and ‘It’s Happened Before, It’ll Happen Again’ sees Rory playing a jazzy Alto Sax and the other two guys stretching out and showing their own capabilities on each track. ‘ Eat My Words ‘ allows Rory to attack his guitar with some vicious bottleneck playing then on other tracks you have the beauty of his acoustic guitar playing. Both albums are worth seeking out. I wonder what direction this band would have gone if they had stayed together….. maybe in a Van Morrison jazzier direction…. unfortunately Rory was to break up the band to head off into the world of a solo performer while McCracken and Wilson were to form a new group called Stud with Jim Cregan (later guitarist of the Rod Stewart band). 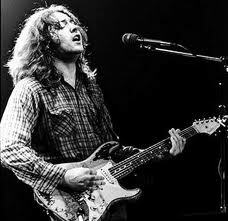 Rumour has it that dodgy management didn’t want Rory to spilt the earnings three ways with the other two and in future would keep his backing musicians on wages, anyway sad to say Rory Gallagher passed away in 1995 at the age of 47 but he did have a long and successful solo career. If you like your guitar players with a blues edge then add these albums to your collection and raise a pint of Guinness and remember Rory, John, Charlie and Taste the boys from Ireland. When Chris Blackwell signed Free to Island Records in 1968 he wanted to call them the Heavy Metal Kids but in stepped blueman Alexis Korner with the perfect name for the band FREE. This band had it all and delivered one of the best all time party records in ‘ All Right Now’ and left behind a fine body of musical work. On Drums ~ Mr. Simon Kirke who could lay down a back beat like the Stax legend Al Jackson of Booker T & The MGs fame. Simon Kirke was rock steady, never too flash and never missed a beat. On Bass ~ Mr. Andy Fraser who was playing with John Mayall at the age of 15 and is an astonishing bass player and co~writer of all the classic Free songs. 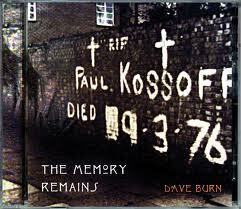 On Guitar ~ Mr. Paul Kossoff, son of actor David Kossoff who was classically trained on guitar before plugging in his trusty Les Paul guitar and becoming one of England’s finest and also my favourite guitar player. On Vocals ~ The one and only Mr. Paul Rodgers, one of the greatest voices England has ever produced and also an excellent songwriter. While I was working at the Marquee Club in London in 1969 the DJ used to play two 45s by Free, one was ‘Broad Daylight’ and the other was ‘I’ll Be Creepin’ which I loved. I had never seen this band play and one Friday night my mates and I made it out to Loughton in Essex to see Free play live. We got a beer and managed to get right down the front of the stage. Free strolled on and in the next hour proceeded to deliver one of the greatest soulful performances from a rock band I have ever seen! ~ very powerful. The band was on tour to support their first album ‘Tons of Sobs’ which has a real blues feel about it with songs like ‘Going Down Slow’ and the Albert King classic ‘The Hunter’, but for me it was the songwriting talent of Andy Fraser and Paul Rodgers which pointed the way forward for the band with songs like ‘Worry‘ ~ ‘Walking My Shadow’ and the brilliant ‘I’m A Mover’ with a blistering solo from Paul Kossoff. Their self titled second album Free was the stepping stone to later success with outstanding songs and playing from the band. ‘I’ll Be Creepin’ ~ ‘Songs of Yesterday’ ~ ‘Lying in the Sunshine’ and ‘Woman’ moulded the classic Free sound. With this band what they didn’t play was as important as what they did play ~ Leave some space for the music to breathe! Next up was their biggest selling album ‘ Fire and Water’ which featured the big hit single ‘All Right Now’ which hit the top of the charts in that hot summer of 1970. This is a monster record even today receiving lots of radio play all over the world. ‘Fire and Water’ is an album where every track is a standout with Simon Kirke driving the band along from behind the Drum set and Andy Fraser delivering the Bass solo to end all Bass solos on ‘Mr. Big’ and gut wrenching guitar solos with understated control from Paul Kossoff and the great Paul Rodgers showing us that he is Britain’s answer to Otis Redding. A must have in any record collection. By this point Free mania had arrived and breaks and disagreements started to appear in the band who didn’t handle success too well due to their young years and the pressure was on to follow~up on the hit album and 45. The next album was not received well but I think that judgment was unfair then or even now, maybe it was the dull sleeve after great pieces of artwork on the three previous albums, but the album ‘Highway’ has some high points and is still a gem in it’s own right. The swaggering ‘The Highway Song’ kicks off the album and is followed by the song chosen as the next 45 follow~up to ‘All Right Now’ ‘ The Stealer’ which couldn’t get arrested on the radio and did a belly flop on the singles chart as did the album, but with tracks like ‘Be My Friend’ ~ ‘Ride on Pony’ and the rest of the album it shows all this band needed was more time for recording and probably a good holiday away from each other as they had been touring endlessly at the point. The band spilt up for the first time and not the last with Kossoff saying that the songwriters Fraser & Rodgers were too restrictive in the studio almost telling Koss what to play note for note instead of the creative input coming from all the members of the band. 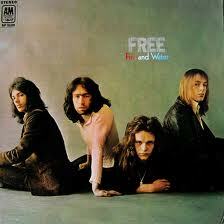 Meanwhile Island Records released the album ‘Free Live’ which shows how good the band was at the time. The band did reform a couple of times and soldiered on releasing two fine albums ‘Free At Last’ and ‘Heartbreaker’ both on Island with Kossoff playing some amazing guitar from deep within on ‘Free At Last’ and sadly only appearing a few tracks on ‘Heartbreaker’ because of drug problems but both albums spored hit 45’s in ‘Little Bit of Love’ and ‘Wishing Well’.Paul Rodgers and Simon Kirke must be thanked for keeping the band together with Fraser leaving and Kossoff going awol at this point . 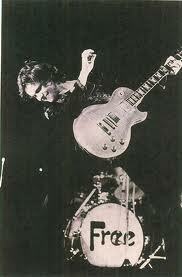 The real tragedy here was the rapid demise of guitarist Paul Kossoff who never got over a serious drug problem when the band initially broke up in the early 70’s, passing away in March 1976 at the tender age of 25 while promoting his new band Back Street Crawler in the USA. A sad loss of a huge talent who is still much loved today. Andy Fraser formed the excellent band Sharks with Chris Spedding but that didn’t last to long, still he kept his hand in writing songs for Frankie Miller, Rod Stewart and Chaka Khan as well as releasing some good solo albums. Paul Rodgers and Simon Kirke went on to form Bad Company and signed to the Led Zeppelin label Swansong and were to conquer America with their brand of stadium rock. 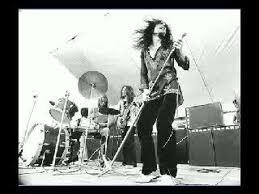 However Paul Rodgers who has played with some of the best guitarist in the world has said that he never found a guitar player to replace Paul Kossoff, not even Jimmy Page or Brian May. Sail on My Brother Jake. You are currently browsing the archives for the British Blues Boom category.